Forward-thinking food businesses have been focusing on this protein for a few years now. The Future of Food and Farming Forum in 2015 was abuzz with its potential. And it’s been growing exponentially as a nutritious, environmentally-friendly alternative protein on plates across the globe. Entomophagy—the practice of eating insects—is a part of many culture’s diets around the world, but is only more recently being acknowledged and valued in North America. And the United Nations played a major part in that: the Food and Agriculture Organization of the United Nations encouraged entomophagy in a 2013 report for its health, environmental, economic and social benefits. From ground cricket flour to mealworm powdered smoothies, from cricket pasta sauce to cricket protein bars, insects are proving to be quite the versatile protein. But it’s not just about versatility. The UN report explains that these insects are rich in protein, good fats and micronutrients like calcium, iron and zinc. Their harvesting is also a low-tech, low-capital investment. Insects emit less greenhouse gases than most livestock, and are also quite efficient at converting food into protein, thus requiring less water, feed and land than traditional livestock (crickets, the report states, need 12 times less feed than cattle). Yet that “ick factor” didn’t stop some forward-thinking Canadian entrepreneurs from realizing the industry’s potential, and capitalizing on that opportunity. Entomo Farms in Norwood, Ontario is a global leader in the cultivation of cricket flour, cricket powder and insect protein (plain or seasoned roasted crickets and mealworms). Their products are sold in Canada and shipped to the U.S., Mexico, South Africa, New Zealand, Australia, and Europe. “More people are willing to embrace entomophagy once they are educated about the benefits, and when they have the opportunity to taste how delicious they are and see how easy it is to incorporate insects into everyday dishes,” Entomo Farms’ Community Manager, Stacie Goldin, tells us. They first began farming insects 14 years ago as a company called Reptile Feeders, which raised and sold crickets and worms for pet food. They transitioned into Entomo Farms, and raising insects for human consumption, in 2014. 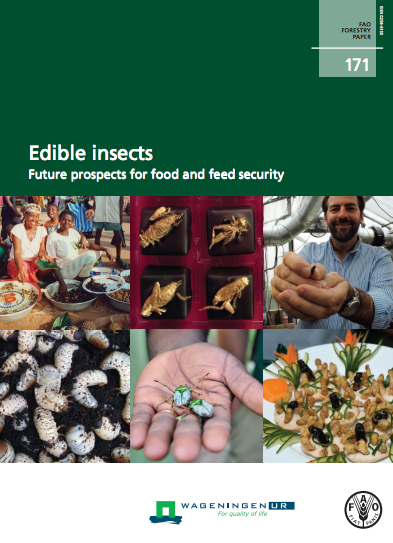 “The adoption rate of people eating insects has increased exponentially since we first began, which is very exciting not only for us, but for the whole industry, and for those who care about overall human health, and health of the environment,” says Goldin. In addition to leading the way in the insect market, Entomo Farms is currently working on getting their products into culinary institutes for students to experiment with, and they’re also working with American universities and others across the globe on various research projects. 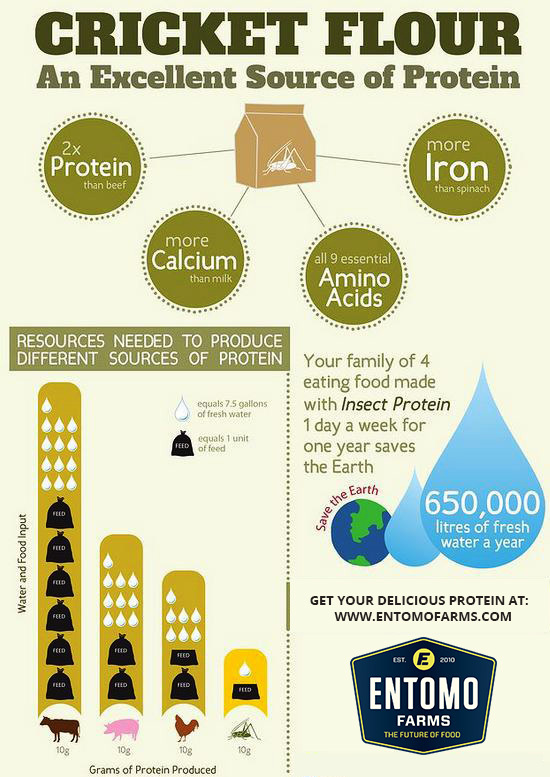 With a rapidly growing population, a resourceful, nutritious protein is surely worth further exploring. “[Crickets] are about 60% protein, are packed with vitamin B12, have more calcium than milk and more iron than spinach, and provide all the essential amino acids,” states this Fortune article that features Exo, a cricket-protein bar company that gets their cricket flour from Entomo Farms. Utilizing crickets, the bars are gluten-free, dairy-free and paleo-friendly. The founders behind Exo were also inspired by the UN report, which has clearly had quite the influential impact on the industry. 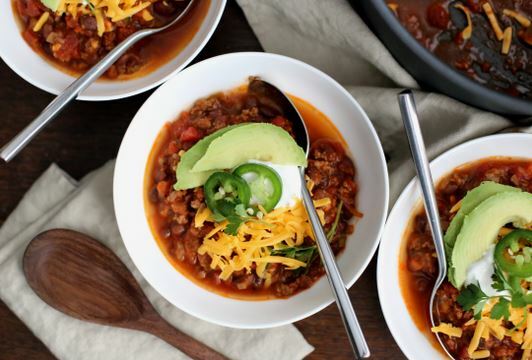 One Hop Kitchen, another growing food business, states on their website: 2 Billion people around the world eat insects daily, what are you waiting for? This Canadian Grocer article highlights the Toronto-based Kitchen’s popular bolognese cricket & mealworm pasta sauces—their success is another indicator of a rise in alternative appetites among ‘conscious consumers’. With support from the Ontario Greenbelt Fund, Entomo Farms are currently organizing a large food event called Jump into Spring, bringing insects on to the menus of restaurants across the GTA during Earth Week. Any restaurants that are interested in getting involved are encouraged to get in touch with Entomo Farms. It certainly seems like an opportune time to hop on board with this growing movement.